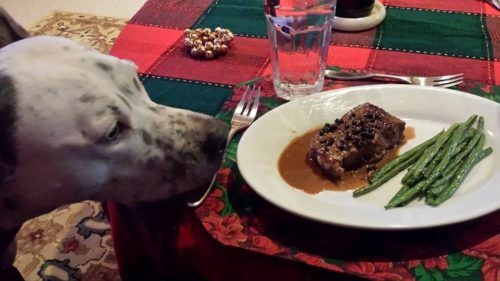 Hubby’s Steak au Poivre. 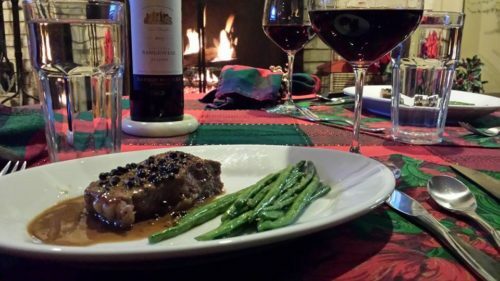 Also known to some as “pepper steak,” this Steak au Poivre recipe is requested so often by friends and family that I decided to publish it. 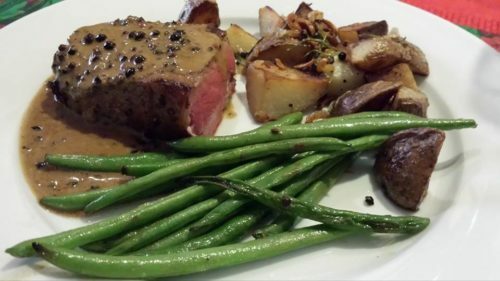 My husband likes to make his Steak au Poivre on weekends. He uses New York Strip steaks that seem to work best for this dish. Olive oil, crushed peppercorns, sea salt, butter, chicken stock, cognac and heavy cream are the other ingredients. This is an impressive dish that’s not too difficult for someone with some cooking experience. Practice a few times before you make it for guests unless you are a well established cook. Also please use a “real” cognac and not the cooking wine that you find in the grocery store. It doesn’t have to be an expensive cognac though. 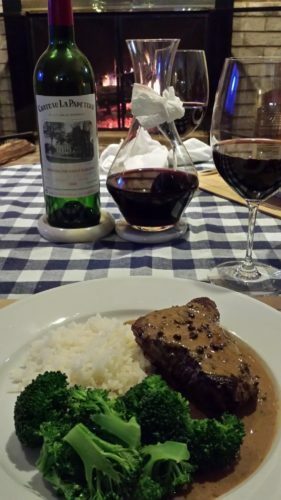 This steak dish begins by rubbing two NY strip steaks with olive oil on each side and season the steaks with salt. Then, crush some black peppercorns with a mallet and press the cracked peppercorns into both sides of the steaks. This is my husband’s “secret” to a very tasty Steak au Poivre as the peppercorns will form a crust on the steaks. Sear the fatty edges of the steaks in a pan. Then turn them and cook on each side to your liking. Remove the steaks from the pan, keep them warm, and let them rest. NOTE: My husband makes this steak dish on the stovetop because he thinks the steaks cook better in a pan than on a grill. 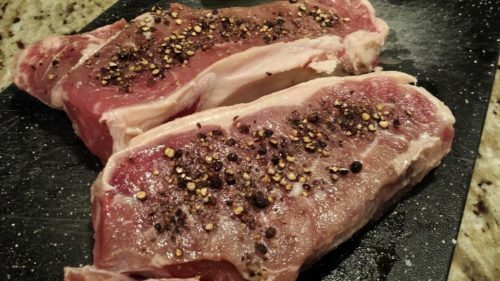 You want the peppercorns to add flavor to the steak and not fall off into the fire. 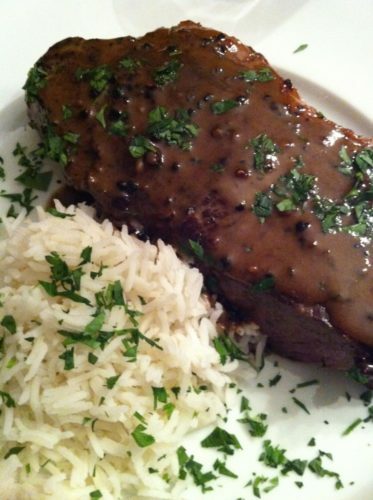 While the steaks are resting, make the cognac sauce. Melt some butter in the pan that you used to cook the steaks. Add some cracked peppercorns to the butter. Deglaze the pan with some cognac. Use a wooden spoon or wire whisk to break up the brown bits in the pan to add flavor to the sauce. Add some chicken stock and whisk off and on until the sauce reduces by half. Lower the heat and add some heavy cream to the sauce, whisking until smooth. Let the sauce cook and bubble a bit, whisking so the sauce doesn’t break. Add the steaks back to the sauce and let them warm through on each side for a few minutes. Plate the steaks and pour the sauce over them. And serve! 1. Rub steaks with olive oil on all sides and sprinkle with sea salt. 2. Put the three teaspoons of black peppercorns into a Ziploc bag and crush them with a mallet. 3. Scatter about 1/2 teaspoon of crushed peppercorns on each side of each steak (so 2 teaspoons total, reserving the third teaspoon for the sauce) and press the peppercorns into the meat with your fingers. 4. Heat 2 tablespoons olive oil in a sauté pan over medium heat. You do not want the oil to smoke though. 5. Using tongs to hold the steaks, sear the “fat edges” of the two steaks until the fat edges have browned. 6. Then sear each steak on both sides and cook the steaks to your liking. 7. Remove the steaks from the pan and set them aside on a plate to rest. Keep the steaks warm and remember they may continue to cook a bit while they are resting. 8. Using the same pan, melt 1 tablespoon of unsalted butter over medium heat. 9. Add one teaspoon of cracked peppercorns to the butter. 10. Deglaze the pan with a splash of brandy, using a wooden spoon or wire whisk to scrape up the browned bits and let the alcohol in the brandy evaporate. 11. Add the chicken stock to the pan and let cook to reduce the sauce by about half, whisking off and on. 12. Reduce the heat to low and whisk in 1 tablespoon of butter. 13. Add 4 tablespoons of heavy cream and whisk until smooth. 14. Simmer the sauce until it reduces slightly, whisking every now and then so the sauce doesn’t break. 15. Add the steaks back to the sauce in the pan and reheat them on each side for a few minutes. 16. Remove the steaks to serving plates, pour the sauce over the steaks and serve!! Makes two fanastic steaks. 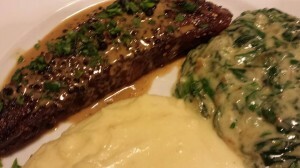 Offer with my Easy Mashed Potatoes and my Garlicky Creamed Spinach and Arugula or steamed broccoli. Serve with a nice dry red wine. 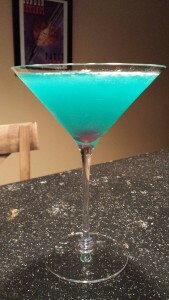 Variations: My husband doesn’t use many variations on his recipes. You could just make one steak for two and cut it in half as we tend to do often. Or you could use a different steak cut that is well-marbled. 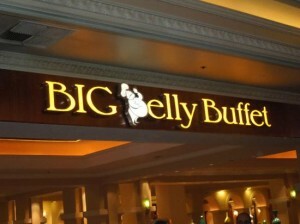 We have used NY strip steaks cut from buffalo meat and they are delicious. I think the filet mignon is not a good candidate for this recipe though since it’s more of a lean meat without much marbling.